Nearly one in four Americans suffers from varicose veins. If you're experiencing the pain and discomfort of varicose veins, make an appointment with vascular surgeon Stephen M. Barnett, MD, at Vein Therapy of Atlanta. 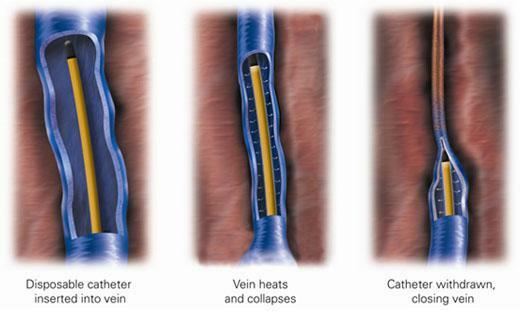 Dr. Barnett has extensive experience using the ClosureFast™ procedure to treat varicose veins and other vein problems. Call today or book an appointment online. Following the procedure, we strongly encourage use of a compression stocking and avoidance of strenuous exercise to promote the best outcome. You will also be able to drive yourself home after your procedure and may return to work the same day. The purpose of saphenous vein ablation is to improve common vein related symptoms, such as heaviness, fatigue, pain and swelling. While ablation of the saphenous vein will reduce pressure leading to the surface varicosities, it will not necessarily improve their appearance and future treatment in the weeks following may be required (typically a covered benefit by your insurance company). Many insurance companies pay for the ClosureFast™ procedure in part or in full, depending on your benefits. The ClosureFast™ procedure has coverage policies with major health insurers.